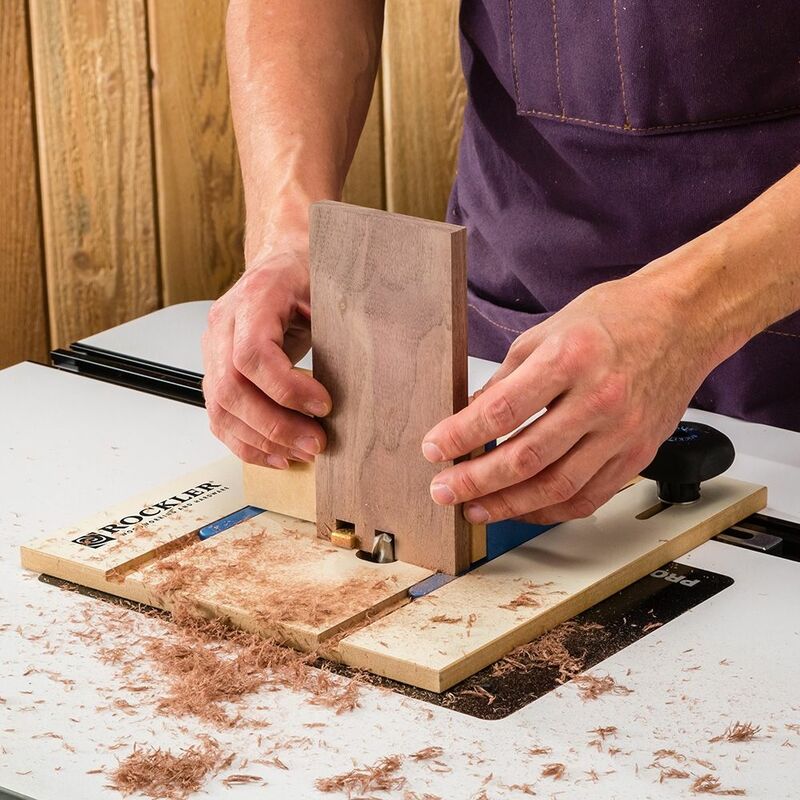 Make strong, tight-fitting box joints on your router table—great for small- to medium-sized boxes! 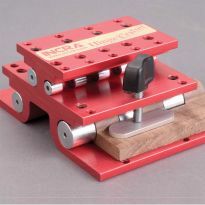 Requires a straight router bit (sold separately) to match the size of the indexing key. Up-cut spiral bits deliver the cleanest cuts and help prevent blowout. I went into this knowing that I would need to make some small mods to make this jig work with my old Craftsman router table. I had to lengthen the two slots for the 5-star knobs by about an inch to allow adjusting the jig forward toward the router bit. The jig's two sleds that run on the table's router miter slot were about 1/8" too high so I took an old table saw miter bar that fits the table perfectly and drilled it to attach the two 5-star knobs & bolts. Also had to modify the router table by cutting two one-inch long slots to allow for adjusting. Works great after that! Great product! Excellent jig for the money! The Rockler box joint jig is absolutely perfect for my needs! Only thing I needed to do was drill a hole for the rotor lift. Was an easy fix! Action is nice and smooth, I put .100 shim under the sacrficial fence to assure easy sliding movement. Joints were perfect right out of the box!, no adjustment was necessary. I am very pleased with this product. This is my third Rockler box joint jig over the last 10 years. I constantly use them on big and small projects with excellent results. Once set up they are easy and fast to use.Unfortunately they wear out. The sled could be a little taller on the latest model. I would recommend it. This the best investment I've made for my shop since I started wood working. It fits my Bosch RA1171 router table with no problem. I have a dovetail jig already and wanted to add the box joint to my jig assortment in case I decided to make something where box joints would be more appropriate. When the jig came in, I immediately set it up for my router table and found it to be well fitting and solid when clamped in. Although I have not used it yet, I'm looking forward to it. 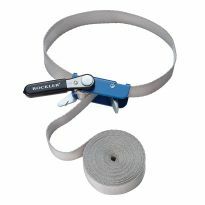 If it's a Rockler product, I expect it to work as advertised. I have tried several jigs for box joints with unsatisfactory results. Finally I found one that works well. This jig is fantastic. I just finished making eight box drawers for an oak desk I’m building. They fit together perfectly and really make each box look like it was professionally made. I love it. I like it. Better than a home made one. Works as advertised. Arrived as promised, I recommend to all. Great jig. Works well. Setup a bit tricky but one you have it figured out it works very well. Well done - good unique design. Good stable design works 90 deg vs other designs. Considering design and all components supplied, worth the price. 2. Apply a good coat of paste wax to the melamine and carriage surfaces to make sliding easier. 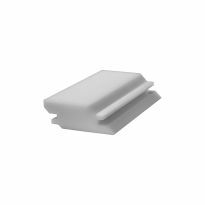 Suggestions: The hole for the router bit needs a 45 degree chamfer to make passing the workpiece over easier and to rid waste better. I used a rat tail file for this to avoid damage to the surface. A directed vacuum to remove waste as it is cut is required. The guide groves in the melamine collect waste which then impedes movement of the work piece thru the router bit. One other thing; Don't back the workpiece over the router bit after cutting. Lift it off the jig, then reverse the fence movement. After easy assmbly, I cut several 1/4" joints in thin ash wood. After adjusting the fit I was able to make a nice little box with near perfect joints. I made two alignment marks with a marker on my router table so I can return the jig to the same position. A very nicely designed jig. makes box making pretty simple. Right out of the box, I was cutting perfect box joint. Minimal learning curve [router bit height ]. I would recomend this to anyone. Well thought out. Easy to learn/use. Precise. Worth the cost. This is a great jig value for making box joints. Took less than 10 min to assemble out of the box, instructions are very clear and easy to follow. Within minutes of setting up, I had made my first box joints and they fit like a glove! Highly recommended! Although the clamps do not fit my router table track I just use C clamps on my table. Makes nice box joints. I bought this jig to make quick painless box joints. After reading the instructions (wrong first time I might add) I was able to perfect the box joints & they are tight as they should be. The only complaint is they could have included the piece of MDF for the 1/4" & 3/8" pieces but I had a piece of MDF laying around so was not a problem. Overall I am very happy with this jig. This product is a dream come true. It makes clean straight 1/2in, 3/8in and 1/4in box cuts every time if you set it up right. It is so easy to use but you have to read and follow the instructions. Now for some of us, like me this is a last resort. The slides are nice and the brasses are the right size. Dust collection might be the only problem with this unit. But, for making a box joint it is great. I set the router table box jig up, dialed it in and made two boxes. I really like the results. Nice and tight finger joints. I like it. This joiner is a good addition to my workshop. So far it is doing as advertised. I just used the 1/4 inch spacer with a 1/4 spiral up bit on scrap wood for practice. First one was too tight a joint and the second was too loose. The instructions that came with the jig helped me to make the proper adjustments. I also tried a straight 3/8 inch bit (didn’t have a spiral up for 3/8 inch spacer as Rockler recommends). It worked out well, but I was only cutting through 3/8 inch wood. Other than the adjustments to make a perfect fit is a bit tricky, I’m happy so far. Before purchasing read the reviews was a bit skeptical but this Jig meet my needs and budget. not sure if there is a standard out there for routers but would expect that most would fall in to Bosch parameters. Anyways it is doable with out any modifications would replace the fence with a piece of wood to create a low profile fence to lock the jig in place with. Good tool. Well assembled and easy to set up. Works pretty well but it takes practice to set it up. First joints were too tight then next set were too loose. The bit and key should be only slightly touching the setup bar. Too tight the joint will be loose. Too loose in the setup and the joint will be tight. May build a threaded adjuster with an 8x32 screw and threaded insert. Much more precise than “ loosen one side and give it a gentle tap”. Simple, accurate and well made. It would be a wise idea to roughenup the sides of the expanding bars that lock it into place to prevent it from moving. Nice jig but a little pricey. Slick! The instructions are iffy for a novice (me)but after getting through the set up it works very well. The jig was easy to put together,easy to learn how to adjust to the three different sizes of the box joints and easy to make good tight finger joints. It only took me two attempts to make good looking and good fitting box joints. 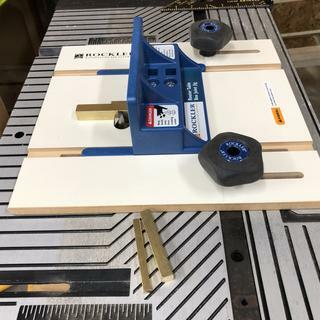 Reading reviews, some people had trouble getting the jig to fit on their non-Rockler router tables, well the jig fits and works smoothly with my Skil brand router table model #RAS900, which is a very inexpensive router table but works well for what I'm using it for. When I got the jig I put it together right away. I was short the two 1/4-20 screws that hold the indexing finger to the the fence. So I had to find two 1/4-20X1" screws to complete my set up. Havent used the jig yet but will soon. Made very well, so I dont thing there will be any problems. Reason for 4 stars instead of 5 is the fact that the screws were not included in the package and they certainly should been. Need a little more quality control on packaging. Bought this to make small boxes. It indicated I needed bits, so I ordered two. When it arrived instructions said I needed spacers to match bits. Fortunately the fingers that are included are 1/2” at the base so I used one of them to cut 1/2” box joints. Been nice to know that spacers were required and even better to make them and bit set available at special price. Other than that it works fine. Don't be thrown off by the economical build -- like any good jig, this does one thing and does it extremely well. 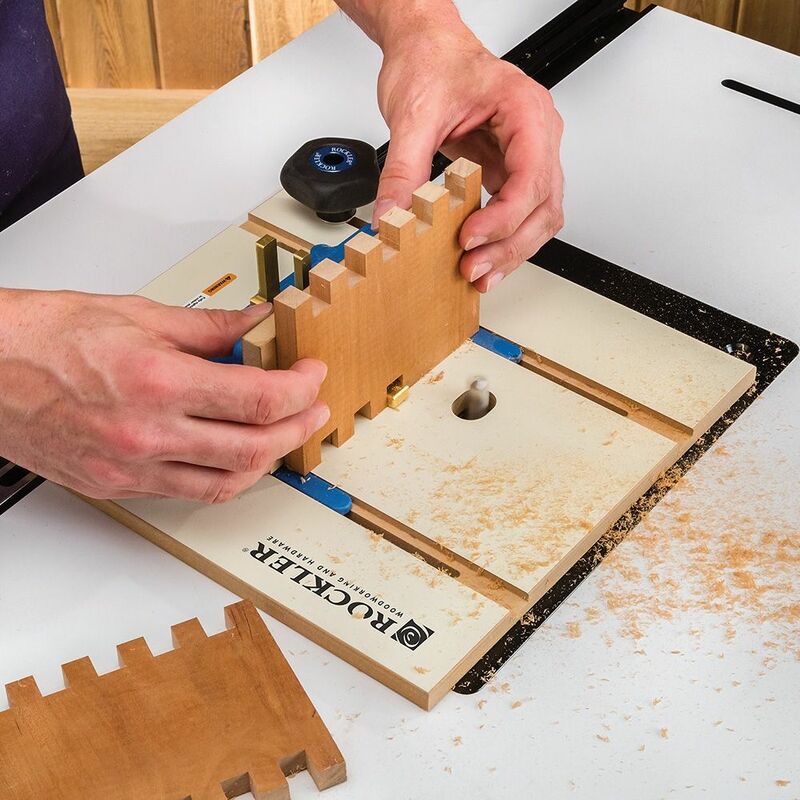 It takes some trial and error to hone in on the set-up you'll need for a particular project (no more than any shop tool), but once you do, creating joints is a breeze and every joint will fit like a good jigsaw puzzle. I created a trial box with beautifully matched corners within two hours of receiving the jig. It's small and light enough to pick up with one hand and tuck away in any spare shelf space. I would recommend getting a set of bar gauges or set-up bars if you don't have one -- it speeds up the prep and cuts down on waste considerably. One quibble: it comes with just one sacrificial fence, set for a half-inch joint. You have to make more yourself. I had a hard time finding MDF in the right width, but once I did, a 2x2 slab gave me enough fences to last an occasional user for years. Easy to assemble. Easy to use. Works great. Overall I like this jig. The set-up was rather fussy but I finally got it. I added a much bigger backer piece allowing me to clamp the work piece and keep my fingers away from the bit. The jig cannot be used as delivered on my router table. I have a JessEm table. The miter slot is too far away from hole that bit comes through. I had to elongate the two slots where the miter slot adjustment is. I wish that the jig was 1 1/2' to 2' inches longer on the base. The quality seems fine. However it required significant modification to use on my router table. The expandable miter bar couldn't't expand enough, even with what I feared would be excessive force, to firmly grip the router table's miter slot. 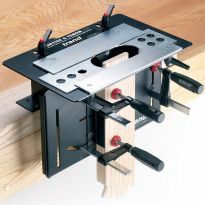 The table is a Bosch RA1181, and the miter slot actually measures 0.785 inch in width. Using an industrial strength adhesive, I glued a long brass shim to each of the expandable bars, and that did the trick. Now the jig won't be shifting position halfway down a line of box joints. It would be helpful if the expandable bars could accommodate slightly oversize miter slots. It's not like the Bosch table is uncommon. It seems that this jig was developed as proprietary to Rockler router tables. The maximum slide distance and opening for the router bit are inadequate for the 24”X 32” JessEm INCRA table and I now find other reviews, about other manufacturers, expressing the same concern; would have been nice to know before purchase. 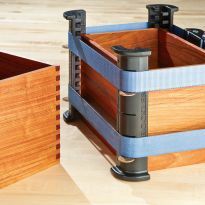 This is a nice addition to making box joints, BUT, Rockler makes no mention when selling it that it does not secure to non-Rocker router tables without modification. 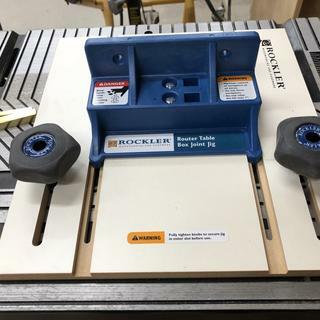 I have a Bosch bench top table and I had to drill new holes in the Rockler jig in order to secure it to my Bosch router table. Just be aware if you buy this and do not own a Rockler router table, you may need to make modifications. I could not get nice tight joints. I returned it. I will submit that it could be operator error but can’t be sure. You need to spend an additional $80!!! For Upcut spiral bits to make it work well. Want to build some boxes for Christmas. I want to make small Boxes and it looks like it would work good! I have another tool for this, a ShopSmith, but this one will do the same job much quicker. Wanted to start making small boxes and other projects. Freiburg has oneused it and loved it got one for myself. 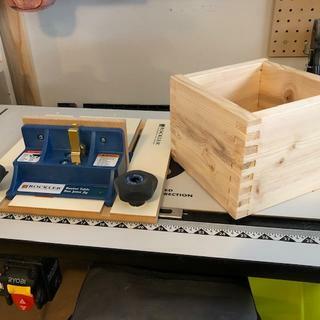 Wanted a good way to make boxes. Want to get into joinery. Just what I need to make a Hope Chest for my granddaughters. After watching a few videos, the jig looks easy to use and should help be in some projects I have planned. It seems to be of good quality and the price is right . FOr the cost it made sense to buy vs make this jig. It looks reliable and would help me make a quality product. I tried making my own jig, and it didn't work out well at all! After watching the video, and seeing the price of the Rockler jig, I decided it would be well worth it, especially with the free shipping promotion. I am also well aware of Rocklers fantastic reputation. Looks like a nice jig and keeps me from having to buy additional tools and parts to make my own. I like the looks of finger jointing. Next to dovetails, they are the best. Also, I'm just not that great at making jigs. Easy to use and makes tight joints! read about it in woodworker magazine and I am making a lot of box joints. To complement the Router table I purchased. Need to construct some small boxes and reviews indicated it was easy to setup & use with great results. How do you make the first cut? BEST ANSWER: You first need to make your three spacers 1/4, 3/8, and 1/2 inch for the setup between the brass bar and the router bit. first slide piece against bar and cut. 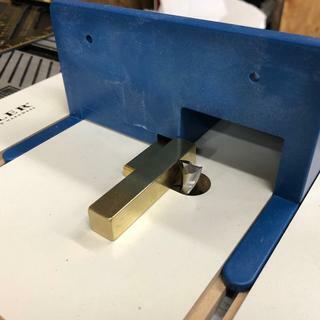 next put the spacer you made against tthe brass bar, and the next piece against the spacer and then the rest is just cut . Write-up says for "3/4 inch miter slot". Does it mean 3/8? BEST ANSWER: 3/4" Wide, 3/8" Deep miter slot. Will this work on a kreg Precision Benchtop Router Table, prs2100? BEST ANSWER: Yes thats what I use. Will it fit on a Bosch RA1181 router table? BEST ANSWER: It should be adjustable to any router top as long as it has a miter slot. This jig fits nicely in the slot on my Bosch router table but tightening the five star knobs only stops the guides from moving on the jig. It does nothing to stop the jig from going side to side in the table slot. Is there some other piece or part I need to stop the guides from moving in the table slot? BEST ANSWER: Add some tape the slot. It will tighten it up. I have a Bosch RA1171 table. I really had to crank the knobs down to kept it from sliding. Does this fit a DELTA 43-505 Router/Shaper? What is the largest size box you can make with this jig? BEST ANSWER: Actually you are limited to the overhead room in your shop, provided you make each cut with the piece tightley against the brass guide. I have done a 2 ' x 4' box with my jig. I guess it also depends on how accurate your set up spacer is. Lots of luck! The only thing limiting the size would be the size of your lumber. What is the best router bit to use with this box joint jig? A up cut or down cut spiral bit or a straight bit? BEST ANSWER: Upcut Carbide bit. Steel bits will dull and overheat quickly. Will this work on a Rockler Trim Router Table? Thank you! BEST ANSWER: The Box Joint Jig anchors to a 3/4" miter track, which the Trim Router Table does not have. 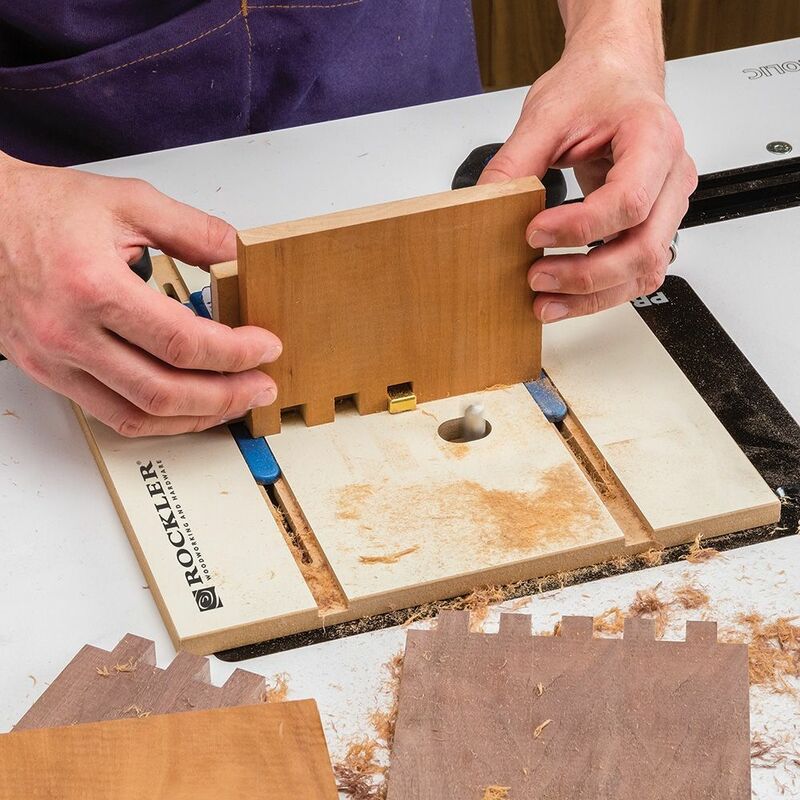 You may want to consider the Rockler Convertible Benchtop Router Table. 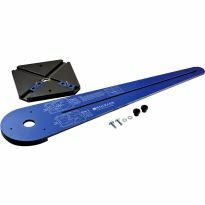 Are the indexing Keys compatible with the old rockler box joint jig?on that model, the indexing is done with long bars that are a pain to store as to swap out. The keys look to be a smart enhancement, but I don't want to buy a whole new jig. And if they are, can I purchase the keys by themselves? BEST ANSWER: Unfortunately I have no experience with the older jig, so to be fair I cannot accurately answer your question. Will this jig work with my Bench Dog router table? Will this jig work on the Sawstop inline router table? Will this jig fit on all router tables? Yes - i think so as long as you have a track to fit it in - there are easy adjustments to make joints. It fit my Bosch router table and I believe it will fit all router tables with a 3/4" miter slot. No I don't think so , I had to make some adjustments to my table. I have a Kreg router table and it fits just fine. Is tear out a problem with this jig? BEST ANSWER: I've used it on Hard Maple, Walnut, Red Oak without a great deal of difficulty. Make sure to trial on scrap wood and make sure adjustments are TIGHT (for repeatability). Take it slow and easy. I like the way it uses TWO miter slots feeding into the router bit for stability. Results were better than I'd had using a similar jig (one miter slot) on my table saw. I believe a worthwhile buy considering the quality of the parts. The board on the jig face can be replaced when and if needed. Its been a while since I used this jig but the enclosed backer boards need to be used with it to help with tear out. I used only cedar and I used an up cut bit (I believe that is the proper term). Did not get any appreciable tear out on the few boxes I made. Hope this helps. Not if you use an upcut spiral bit. I've use Whiteside upcut spiral bits with mine and have had no tearout issues. Other good brand upcut bits should work as well. Not if you use the matching Rockler router bits and cut the notches at board ends. There's significant tear out if you cut the notches along board edges. 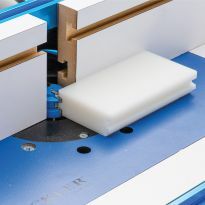 Does this work only on Rockler tables? Can I use it on my Craftsman table? BEST ANSWER: This works fine on my Kreg table. 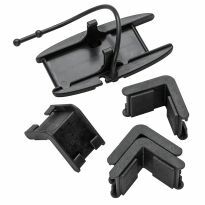 As long as the table has a standard mitre slot and the slot is no more than 7 inches from your router opening or the position of the router bit when it is above the table. I made my own table and it works fine. Just check your distance from bit center to the track. I used it on my Bosch table, which is very similar to a Craftsman and it worked just fine. I don't know. I have a Rockler table only. Sorry I cannot give you a good answer. Not sure about Craftsman but I use it on my Kreg table. Will this work with a WoodCraft table? BEST ANSWER: I'm not 100% sure of this but it should work on any router table with a groove for a miter gauge on the front edge. That's where the jig mount/secures to the table. I don't know for sure as I made my own table. The device should work with any table I imagine as long as you have a channel to lock it down to the table surface. Will this fit a Bosch Router Table - RA1171? BEST ANSWER: I have a Bosch RA1181 router table and the jig fits fine in it but make sure that it is properly tightened as specified in the installation instructions. It should fit any router table with a track. I have made several boxes works super. Very accurate . Please answer if you do know...thx. Will router and jig handle bamboo flooring? BEST ANSWER: Possibly, this jig is small, so if the pieces of flooring aren’t too long it should work. I find if the work pieces are over two feet long it’s difficult hold them in the jig to get accurate cuts. Will this work on a Jessem router table? Yes I had to drill three new holes to get mine to work on my Jessem but easy to figure out were to drill. I don't know I had to modify my router table by adding a new track. It is a very good little jig. Do you need more than one superficial backer board. As I read in the book it says to make 2 other backers so you have 3 backers of the 3 sizes of the pins, ? BEST ANSWER: Yes, you need one for each pin size. First so that each will fit snugly around the guide pin you are using and second to avoid tear-out in your workpiece. I would also recommend a new backer when you change the depth of cut to avoid tearout at the top of the cut. Three separate ones will give you better cuts. It's easy enough to do. Would this work on my Bosch router table? BEST ANSWER: It should. It works fine on my Kreg table. Where can I find a class to learn this????? BEST ANSWER: I'm not aware of any classes being offered but you could check with your local Rockler store for one-on-one set up and use instructions. They're usually very helpful. I don't know of any classes for this tool but if you search You Tube for " Rockler Router Table Box Joint Jig" you will find several videos relating to it. Thank you for your input and I’ll check it out! what is the best router bit to use with this jig? BEST ANSWER: I use upcut spiral bits. They can be kinda spendy, but a clean cut is important. The ones that come with it. Mine is four years old and the ones that come with it are long gone. Item # 30166 from Rockler, 3 piece uncut bit set work great and seem to last. Will this jig work on a craftsman router table? BEST ANSWER: As per the specs of the box joint jig, Near edge of router table's miter track must be between 4-1/2'' and 6-1/4'' from the center of the router bit. Also the miter slot must measure 3/4 wide by 3/8 deep.. I have a royobi router table and the first spec was alright but the miter slot wasn't. I needed to modify the miter slot and rout a 1 inch slot to accept a rockler miter bar. I am using it on an older Craftsman router table and it works great. Would this jig work to put through dovetails in the face of the wood I am using to make a flag case? BEST ANSWER: Sorry this jig is only for finger joints. If your looking for a jig I do recommend checking out the dovetail jigs available at Rockler. They have different varieties. Hope this helps. I have rocklers router table and the miter slot is farther away than the recommended distance by 1/8” -1/4” will I have a problem? I wanted to know if I bought the jig it would work on my table. It says the miter slot should be 4 1/2” to 6 1/4” from the center of the router bit. I have a rockler table but the slot is 6 3/4” to the center of the slot or 6 3/8” to the edge of the slot. My question is is there enough extra room for it to be able to clamp it in the miter given my dimensions? Thanks now I know it will work a purchase is going to happen. I don’t understand the question, not enough info. What miter slot, too far from what recommend distance? 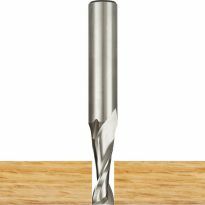 How deep can slots be cut in the material using a stander router bit? BEST ANSWER: Per the downloadable directions the maximum thickness is 1". That is also the length required for the fingers. Depth of finger cut is the thickness of the wood being used plus a very small amount so you can sand the fingers flush after assembly..
That would depend on the length of your router bit. The base of the jig is 1/2 inch so your bit would need to extend an inch above the table to make a 1/2 inch deep cut. as deep as your router bit is long. 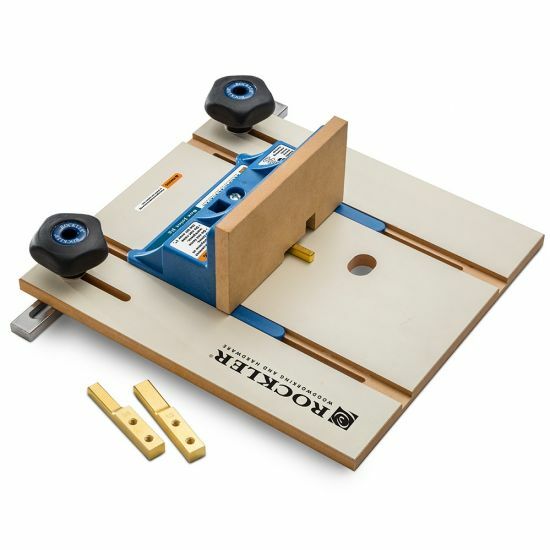 Anybody use this jig on a Rockler convertible router table? BEST ANSWER: It works perfectly for me. If you use box joints a lot it is a must have too. How do you tighten the joint? I use Yonico up bits. BEST ANSWER: Sorry - I do NOT have this jig. If a joint is to tight how do you make it fit?